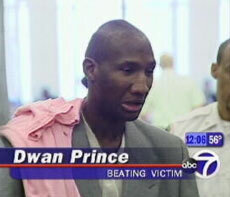 25-year old Steven Pomie was sentenced yesterday to 25 years in prison for June 8th, 2005 beating of Dwan Prince (pictured right in a Channel 7 News screen capture). The reason for the attack? Pomie, according to the New York Times and other previous reports on the assault, told police that Prince had made a pass at him as he walked down the street. In announcing the sentence, Justice Deborah A. Dowling of the State Supreme Court of Brooklyn said "Words alone should never be enough to provoke such a rage. That's never an excuse for anything." Mr. Prince, who was left with serious and permanent neurological and cognitive damage as a result of the beating and has a tough time formulating sentences, tried and failed to read a statement during sentencing. His mother, Valerie Prinez, spoke for him: "I've changed so much I can't even cry." To the end, Mr. Pomie denied being the lead assailant during the beating though he appologized yesterday to Mr. Prince and his family. His attorneys might appeal the court's verdict. In the meantime, Brooklyn had more reasons to cry yesterday as yet another man was found dead in Prospect Park in an area known to be a gay cruising site. Though it is not known if the victim, 61-year old William Oliver was gay, as Rod2.0 points out, it's not the first time that an attack has happened in the area.